Are you ready for a stunning blue cocktail with a sweet tropical fruit flavor? Then you will want to pick up a bottle of Hpnotiq and shake up a marvelous drink that is sure to impress all of your friends. Hpnotiq (pronounced like hypnotic and often misspelled Hypnotiq) is a pale blue liqueur produced in France. It is made from a proprietary blend of tropical fruit juices, premium French vodka, and "a touch of Cognac." You cannot miss the bottle on the liquor store shelf. It has the allure of an ocean blue spirit inside a frosted, Champagne-like bottle. Since its release in 2001, it has scaled to the top of the luxury liqueur market and is a staple in many bars. 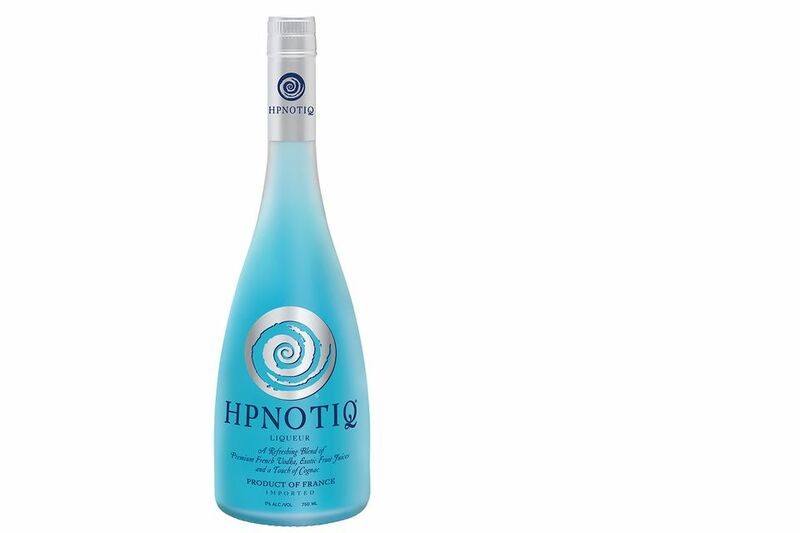 Hpnotiq weighs in at 17 percent alcohol by volume (34 proof). You can typically find a bottle for around $20. This is a unique liqueur and there are no good substitutes for it. What are those "tropical fruit juices" exactly? Well, we don't know. It is, after all, a secret recipe. However, you will catch the taste of mango along with some passion fruit and citrus notes. It is a very bold fruit flavor with a sweet background and its greatest appeal is to young women. What gives the liqueur its color? That we also don't know. The brand says that this is one mystery that will never be revealed. Yet, according to company statements, it seems to happen sometime during the fruit maceration process. A blend of five distinct Cognacs is used in Hpnotiq. These include Petite Champagne, Grand Champagne, Borferies, Fins Bois, and Fins Ordinaire, each of which has been aged in oak. The vodka that goes into the blend is also made in France. It is triple-distilled in small batches from grain and uses spring water along with charcoal filtration. All of this is to ensure a quality vodka goes into the blend. With the three ingredients ready, it is up to the master blender to bring them all together to create what we find in our bottles of Hpnotiq. Hpnotiq has become the blue liqueur of choice for many bartenders. It and blue curaçao are two of your best options when it comes to making blue cocktails. Hpnotiq pairs well with almost any distilled spirit you want to mix it with, though the lighter the better. Try it with Champagne, coconut rum, or any vodka or gin. Be sure to taste it with tequila in a Margarita, too. You really cannot go wrong with a simple recipe that includes Hpnotiq. For example, the Halloween Hpnotist simply pairs Hpnotiq with vodka and a splash of lemon. Top that drink off with soda and serve it tall for an Air Force One. The Mad Eye Martini adds a little lychee juice and the eyeball garnish that goes along with it is pure genius. While Hpnotiq is good on its own, it can be too sweet straight out of the bottle. Shake it up with ice to give it a little life and you will have a much better drink. In 2014, the brand released Hpnotiq Sparkle. It is everything that we came to enjoy about Hpnotiq—blue color and tropical fruit taste—with "Champagne-like bubbles." This is a seasonal release that typically appears around the winter holidays, though it is unclear if it will be a regular offering. This sparkling drink can be served straight, just be sure to chill the bottle before pouring. In lieu of Hpnotiq Sparkle, simply mix the standard Hpnotiq with your favorite sparkling wine. Hpnotiq Sparkles is 12.5 percent ABV (25 proof).